The Thomas St Project is the new purpose-built home of the UTS Faculty of Science and Graduate School of Health. The landmark building was designed by Durbach Block Jaggers, in association with BVN Architecture. It has been future-proofed to accommodate more than 1200 staff and students over eight occupied levels, three of them underground, and is notable for its state-of-the-art teaching, learning and research facilities. With its organic, flowing lines, the exterior of Building 7 declares that this is a structure that dares to be different, and the interior is equally note-worthy. Achieving a 6 Star Green Star As-design rating, the building features a highly sustainable design which also complements the functionality of the highly efficient building. Below ground, the building features a state-of-the-art ‘Super Lab’ which is an ingenious lab teaching space which allows for multiple classes to concurrently teach simultaneously via hi-tech audio visual mediums which were developed specifically for this lab. 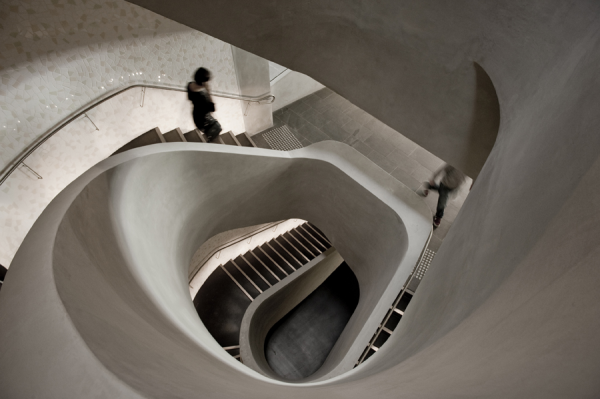 UTS creates, world leading Science and Health facility. Purposely designed to focus on the “Human Element” while maximising UFA and natural-light throughout. The building contains a range of complex science and specialist research facilities including – clean suite, vacuum and furnace lab, imaging suite, PC2 labs and QC labs, state-of-the-art forensic lab, clinical teaching spaces, an auditorium and Australia’s largest undergraduate science teaching space, a 220 seat Super lab. The building's façade, an Australian first, is a monolithic light-weight structure dynamic in 2 planes, with double layers of offset windows for each floor. The windows vary in size and are arranged in a concertina pattern, swelling and billowing with the building’s curving form. Graded coloured reveals, based on the colour works of artist, Gustav Klimt, are reminiscent of a grove of trees is made from 97% reconstituted glass. The Design provides sculpted circulation throughout the building linking student commons, meeting spaces, labs and specialist spaces. 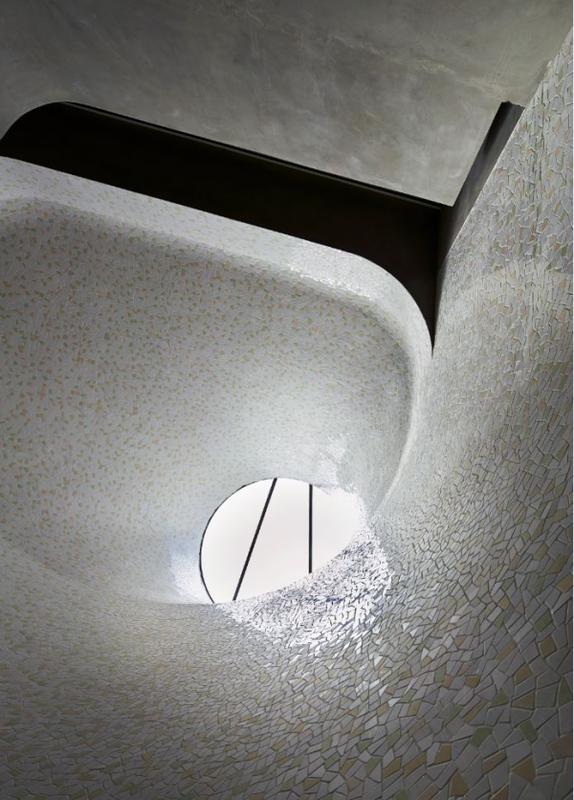 A ribbon of tessellated wall tiles weaves its way through the building making connections, and provides magnified natural light together with strategically located sky lights throughout. 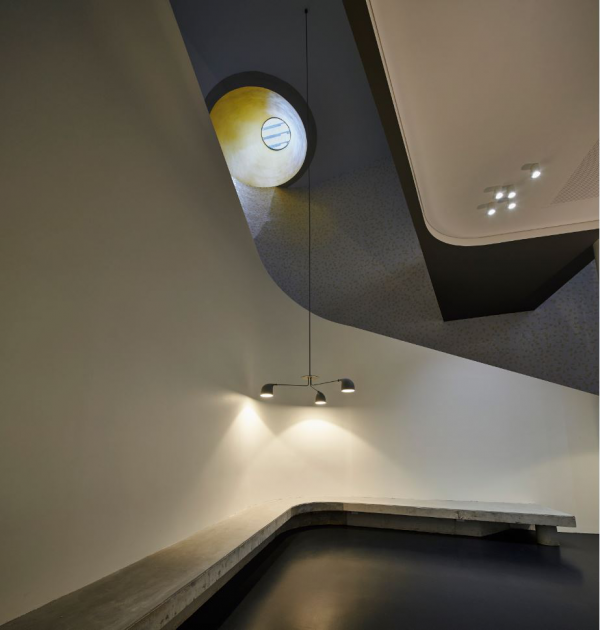 This maximises light to rooms above and below ground. The Thomas St building incorporates a labyrinth that has been designed around the adjacent library retrieval system providing a natural cooling/heat exchange system which stabilises the air temperature at 17-18°C. The stabilised air is then washed over the below-ground plant rooms providing potential operational cost savings of up to 20%. 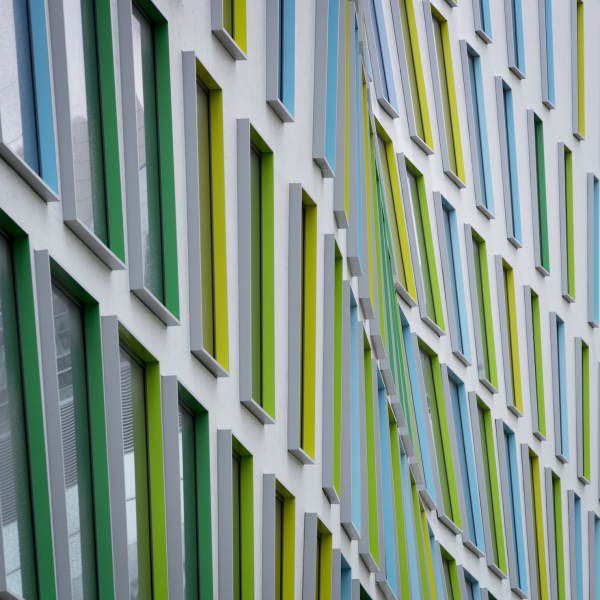 The monolithic façade incorporating the German ‘Sto’ system allowed the design team to modulate the façade on both the vertical and horizontal planes achieving the appropriate sun plane for the Alumni Green while maximising building height. The highly flexible 'Sto' facade accommodates fluctuations in building movement allowing minimal joints achieving the monolithic finish. UTS have strategically located people counters and cameras to monitor movements within given spaces. This has been integrated into the University’s building management and room booking systems in order to provide maximum building utilisation. 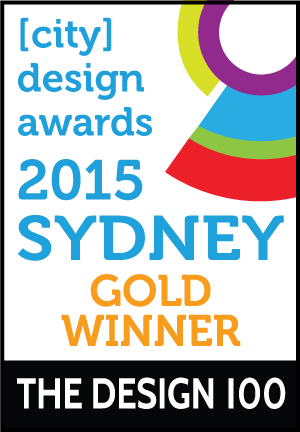 In addition to the above, as previously stated, the project has been awarded a 6 Star Green Star as-design rating. This achievement is commended due to the building being a research and teaching facility and therefore highly services focused. This efficiency in the design and operation has allowed the sustainability aspect of the building to be acknowledged. 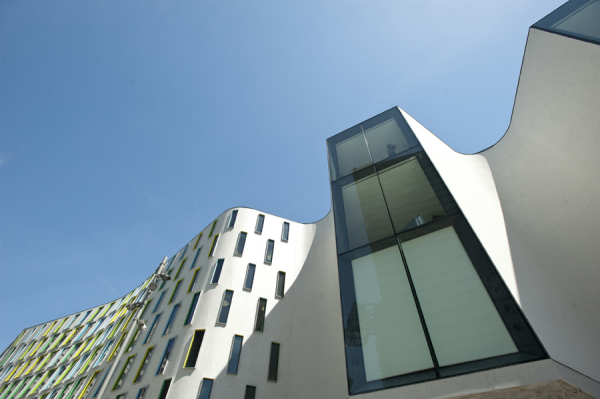 The building is five storeys above ground and three storeys below ground with a roof garden providing open space for informal teaching, research and collaboration. The scheme locates laboratories centrally to the northern side of the building to manage the heat load from that façade with the conditioned spaces of the laboratories. 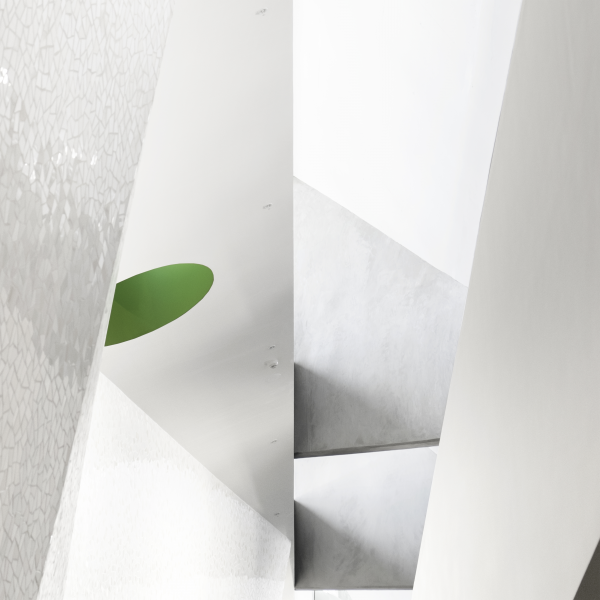 The sun access into these spaces would be controlled with deep reveals to the outside, light shelves below the upper tier of windows to bounce light deep into the space, and blinds to limit glare and any direct sun infiltration. The challenge was to provide multiple, legible access to these spaces along with access to natural light and visual access to the Alumni Green. 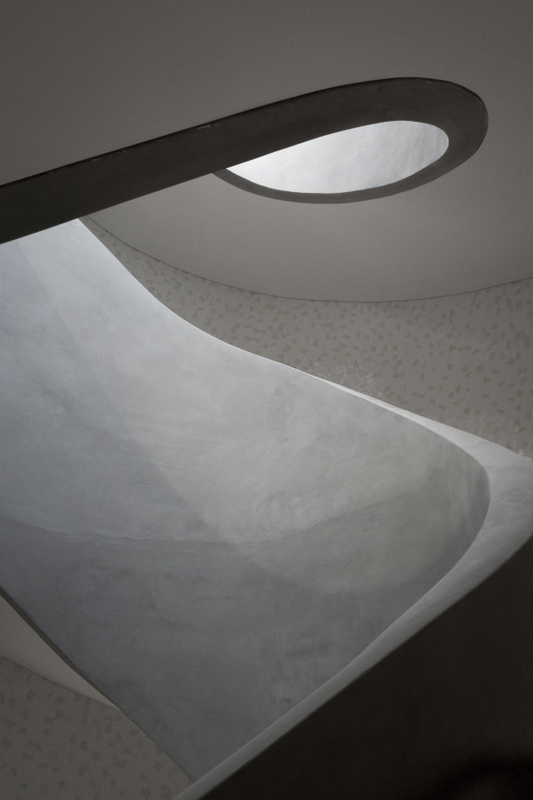 This was achieved in the design through a folding, tiled void running the length of the building east to west and connecting through to the vertical circulation of the main spiral stair. This atrium like space connects the primary building teaching space, the Super Lab, two levels down with its associated student commons spaces, through a light scoop running along the Alumni Green colonnade and circular skylights strategically placed within its’ geometry. 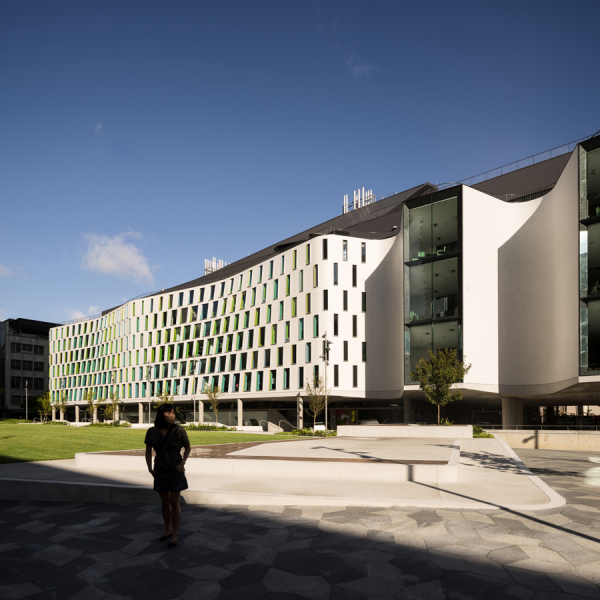 The UTS Science and Health Building achieved a 6 star green Star rating through numerous incremental design elements, including pre conditioning intake air via a labyrinth in the Library Retrieval System, the use of a façade material made up of 97% recycled glass and the provision of a green roof to the building. 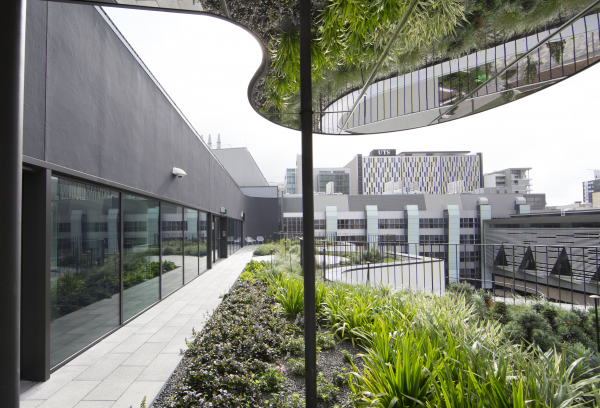 The roof garden on Level 7 of the building also acts as a water catchment. This water resource is subsequently filtered and services the buildings non-potable requirements. In addition the Alumni Green acts as a water catchment for irrigation re-use over the Green.